If I had to name the Number One thing that people requested I bring to gatherings, it would probably be these chocolate chip cookies. I’ve been making them for what feels like forever at this point. They were the first recipe I made in my trusty KitchenAid stand mixer. I remember being so excited when we received it as a wedding gift from the office we both worked in at the time. I had coveted one for so long, I didn’t even know where to start with what I wanted to make. It was late that evening when it finally claimed it’s space on the countertop, and I wanted to make something that night. Breezing through the book I came across the chocolate chip cookie recipe, and thought that was a perfect way to “Christen” the ol’ girl. They turned out wonderful, best cookies we’d ever had. Over the years, most people who’ve tried them agree. I’ve made these cookies so many times I don’t even look at the recipe anymore. When I knew that I wanted to put them up here, I checked the original recipe and discovered that it calls for baking soda. I’d been using baking powder. So, I baked a batch with the soda…and, they weren’t as good. They fell flatter and darkened more. So, we’re using baking powder for my version. If it ain’t broke, don’t fix it. Right? I also feel that nuts are a necessity in a chocolate chip cookie so I’ve added those as well. Walnuts are my favorite, but pecans are wonderful too. These would be a welcome addition to any cookie package you were putting together for Christmas gifts. They are always a part of mine! I hope everyone has a great weekend in their kitchens baking – I know I have a lot to do. My oven is going to be working overtime! I love chocolate chip cookies. Would you add more chips in place of the walnuts? I am allergic. Sure, Katie! Nuts are completely optional. I’ve mixed it up with different kinds of morsels before…milk chocolate, bittersweet, white, peanut butter. You can’t lose! These cookies look fantastic. I love cookies with nuts too and bet the pecans would be a nice change of pace from walnuts. Photo is great and makes the cookies enticing. Just featured your recipe in my blog post. Love this recipe, I have used it three times this month. It makes the cutest perky fluffy chewy cookies. The baking powder made ALL the difference. Thank you! I’m so glad you love it as much as we do! 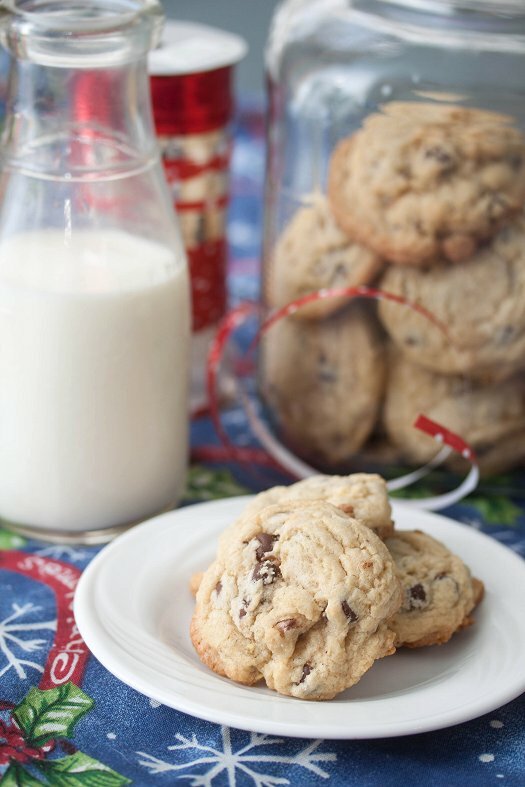 What a great classic chocolate chip cookie recipe – I will need to try it out sometime!